Some chemical companies, including a prominent pesticide maker, is navigating the new Washington by trying to work with the Trump administration under the table, per an AP exclusive by Michael Biesecker. "Dow Chemical is pushing the Trump administration to scrap the findings of federal scientists who point to a family of widely used pesticides as harmful to about 1,800 critically threatened or endangered species." 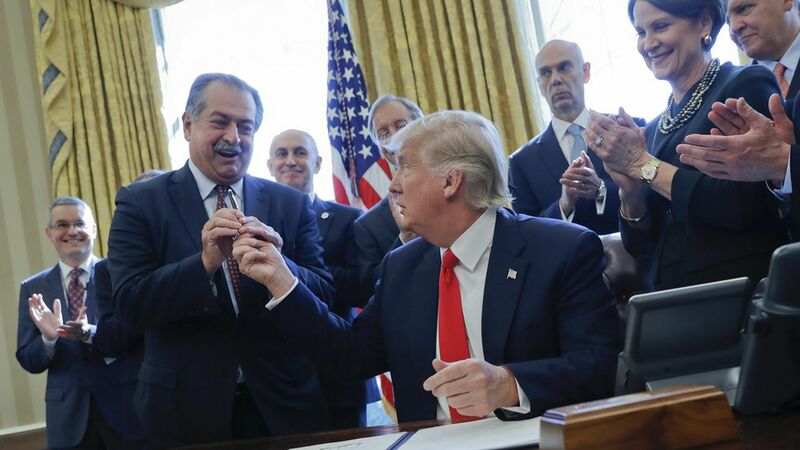 What happened: "Lawyers representing Dow, whose CEO also heads a White House manufacturing working group, and two other makers of organophosphates ... asked [three Cabinet agencies] 'to set aside' the results of government studies the companies contend are fundamentally flawed." Why it matters: "Dow Chemical chairman and CEO Andrew Liveris is a close adviser to ... Trump. The company wrote a $1 million check to help underwrite Trump's inaugural festivities." The context: "The industry's request comes after EPA Administrator Scott Pruitt announced last month he was reversing an Obama-era effort to bar the use of Dow's chlorpyrifos pesticide on food." The response: An EPA spokesman said Pruitt won't "prejudge" any potential rule-making decisions as "we are trying to restore regulatory sanity to EPA's work." From WSJ: "Exxon Seeks Waiver for Russia Deal," by Jay Solomon and Brad Olson: "Exxon Mobil Corp. has applied to the Treasury Department for a waiver from U.S. sanctions on Russia in a bid to resume its joint venture with state oil giant PAO Rosneft."